On January 13, 2008, the 132 meter long, 6467 gt general cargo ship Ice Prince encountered bad weather in the English Channel while en route from Sweden bound for Alexandria, Egypt with some 5,260 ton cargo of timber. Some 3,000 tons of timber was placed into the vessel hold while another 2,000 tons was stacked on the deck. As heavy 5 meter swells lashed against the vessel, the Ice Prince had its cargo of lumber shift in the hold while off Start Point. The Ice Prince quickly developed a 25 degree list. In addition, the cargo ship suffered a power blackout leaving some navigation lights and upper deck lights visible. 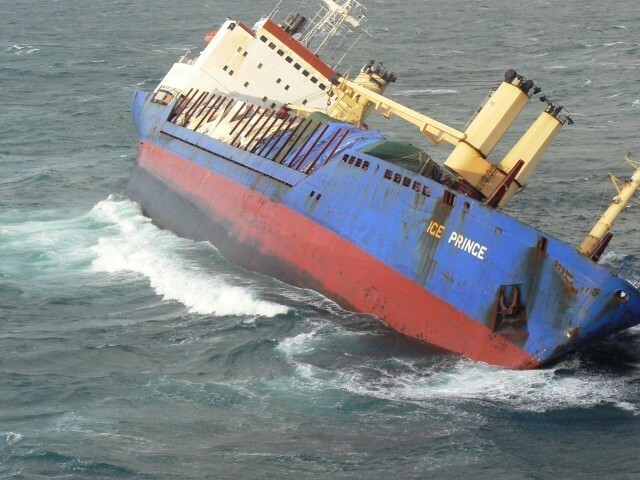 The Ice Prince deck cargo spilled out into the sea as the vessel to increase its list. The Ice Prince’s list would increase to 40 degrees before it eventually sank on January 15 in the English Channel off Dorset, England. The vessel sank and rests some 47 meters below the seas. The Ice Prince had some 313 tons of bunker fuel on board and an oil sheen was spotted above the wreck. The heavy seas dispersed most of the pollution. The 2,000 ton of the lumber from the deck was eventually washed ashore. Local authorities placed beaches out of bounds and heavy equipment was brought in to remove the timber away.